Sheilagh Brooks received her bachelor’s degree with honors in anthropology from the University of California, Berkley in 1944. In 1951, she became the first woman to earn a doctorate in physical sciences at Berkley. She held a number of teaching jobs throughout the western United States, before taking a position at the University of Colorado, Boulder in 1963. Sheilagh taught at Nevada Southern University during the summers of 1961, 63, and 65. She married an archeologist, Dr. Richard Brooks. In 1966, the Brooks moved to Las Vegas permanently, where Sheilagh was the first full-time professor of anthropology at the young university. The Brooks quickly became involved in local archaeology and preservation efforts. 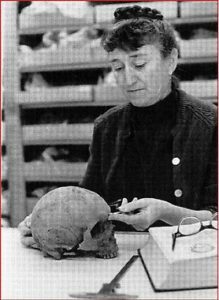 Sheilagh Brooks was known as leading scholar in bio-archeology and forensic anthropology and published extensively. She led a study in the 1970s of the remains from the Kiel ranch in North Las Vegas, and determined that the brothers did not die in a murder suicide, but were murdered by someone else. In 1985, she received the Distinguished Faculty Award and in 1987 the first Distinguished Professor award at UNLV. Sheilagh Brooks died in 2008 after suffering from Alzheimer’s disease. UNLV recognized her service to the university and named the Sheilagh Brooks Osteology Research Laboratory in her honor.